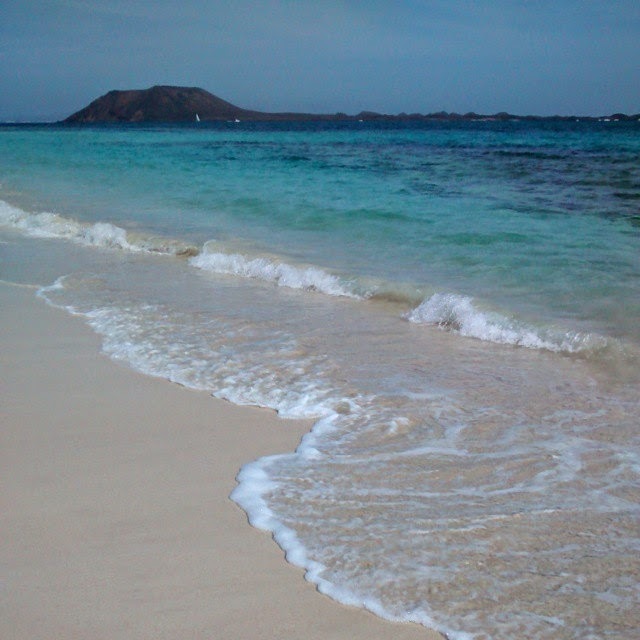 Fuerteventura is the most Eastern island of the Canary Islands therefore the closest to the coast of Africa. It’s has a volcanic origin and let’s be honest, there’s not much to be found on it. Still we gave it a good go and went to explore its secrets. The part of the island we were most interested in was that long stretch of whiteness that on clear days can even be seen from our ‘home’, Arrecife in Lanzarote. 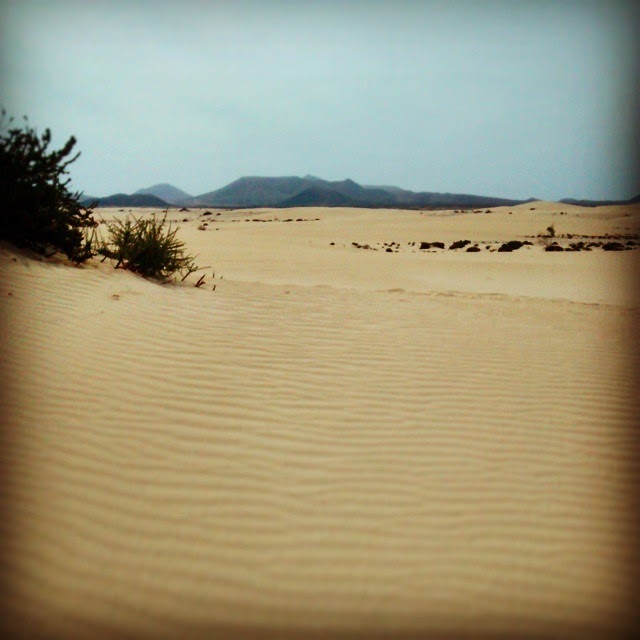 We took the ferry over, hired a couple of bikes and in a few minutes we were riding between the seemingly interminable white dunes of the National Park of Corralejo. You are suddenly surrounded with a Sahara-like landscape and you cannot resist stopping and walking on this 7km long gorgeous golden sand. And when I say golden I mean the purest white soft sand that seem to melt and shape around your foot when you step on it. This quality is due to its organic origin as it is make up of broken shells and skeletons instead of the yellow sand blown over from Africa. Who would’ve thought that sharp volcanic rocks are hiding under the several meter thick blanket of sand? To be honest we didn’t get too far as the sparkling turquoise water was calling us. 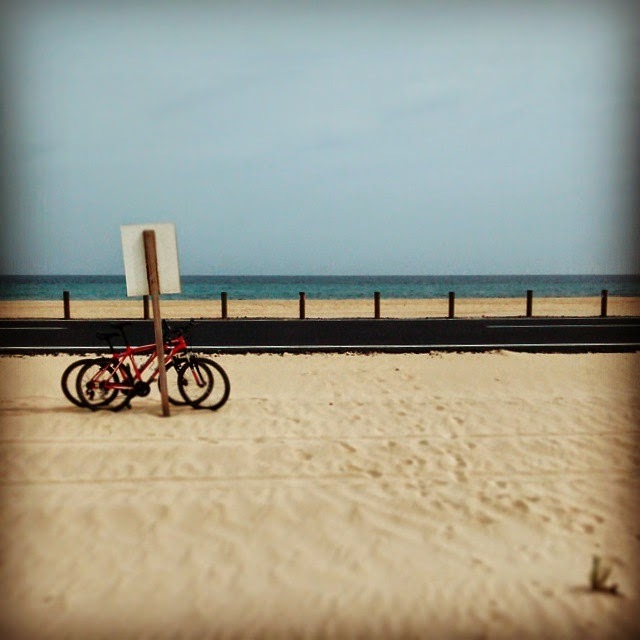 We dumped our bikes and went straight for the sea. Here the water is so blue, so clear that you just have to go and run into it … and run out of it in the next second as the water is so cold!! The view is completed with the Isla de los Lobos and Lanzarote in the background. If you can tear yourself away from the perfect combination of sea, sun, sand and the cooling breeze you can explore some more of the 24 km2 of the Park. A bit further up along the coast there are many smaller beaches and tiny coves waiting to be explored. Even during high season there’s a good chance that you can find a secluded spot if you feel like being away from the crowd. Make sure you stop on the way to have a look at the dunes and take some spoof Sahara photos. The PV–1 road that goes through the Park connects the two main port towns, Corralejo and Puerto Rosario. There are plenty of parking available on the side of the road and there are a few parking lots in the vicinity of the most popular areas. Just a word of warning: make sure that you don’t park your car in the sand as the wheels can easily get stuck! Also, be advised that there is no lifeguard service on some of the beaches so swimming is at your own risk.